Kingscliff gets Moo – ving with music festival. 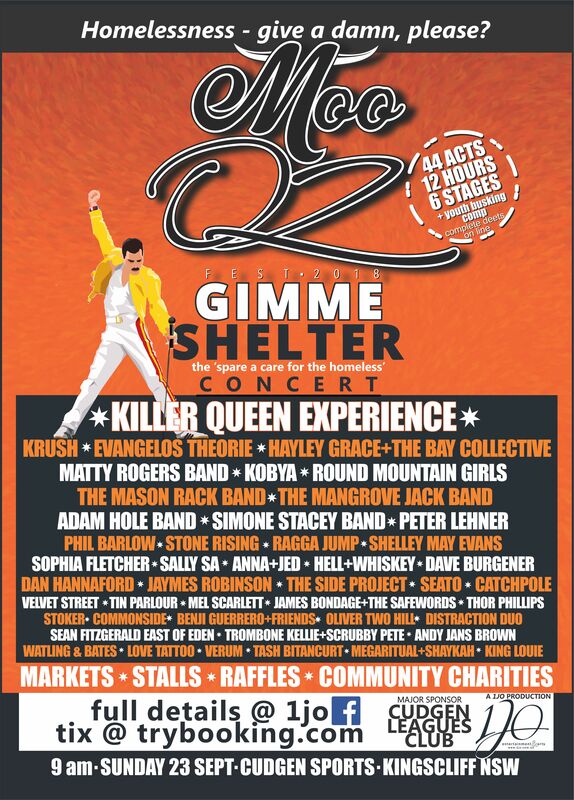 Moo Oz – Gimme Shelter is here. Get ready to MOO-ve. Kingscliff has seen some big names come to town over the last few months and now it is time to show off some of our local talent. The festival will be held 200 metres from the beach at the Cudgen Leagues Club. On Saturday 23 September, Moo Oz Festival 2018 will raise the profile and support of local music culture amongst musicians and the public. Over 6,000 people will come to this picturesque beachside town to enjoy 44 acts over 6 stages in 12 hours. They will also be raising funds and awareness in support of the homeless and their support agencies across the Tweed. An initiative of 1jo Arts and Entertainment the festival is all about celebrating local musicians and giving new talent an opportunity. With the international Killer Queen Experience as the headline act it will be hard to sit still. The music will be as different as the local area. With the Round Mountain Girls, Krush and Hayley Grace and the Bay Collective adding to the mix there is sure to be music to get everyone moving. For the budding musicians there is a Youth Busking Competition (spaces are filling fast).There will be the chance to win a signed guitar on the day and have your chance to shine on the big stage. A childrens tipi will be available with workshops and fun activities at the Little Moo Oz Fest.